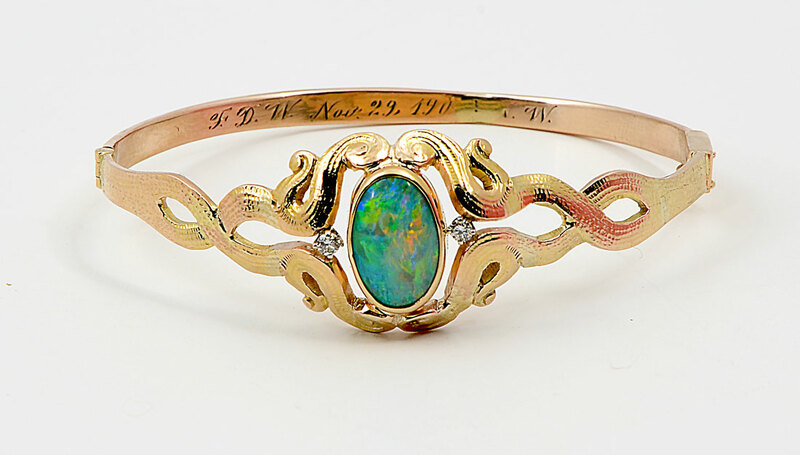 14K OPAL BANGLE BRACELET: 14K yellow gold bangle bracelet contains one oval cabochon cut opal. WEIGHT: 2.00 Ct. Approx. Red/Orange and Blue/Green play-of-color. 2 round brilliant cut diamonds. WEIGHT: .10 Ct. Approx. Rated VS in clarity and G-H in color. The opal is bezel set. The diamonds are prong set. Hinged bangle with locking closure and safety clasp. Weight: 14.1 grams.